US #4125 – The first Forever stamp, issued on this day in 2007. Click image to order. 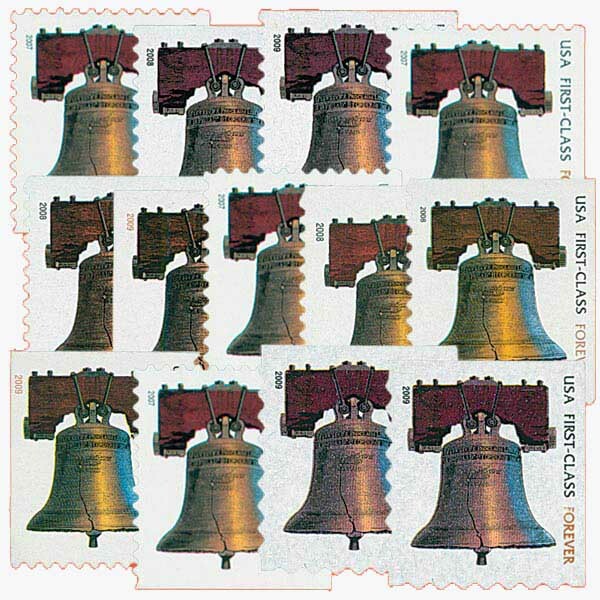 On April 12, 2007, the USPS issued its first Forever stamp, which featured a patriotic image of the Liberty Bell. The USPS has issued non-denominated postage in the past. In 1975, they were unsure when and how much the postage might increase, so they issued that year’s Christmas stamps without denominations. That saved them from having to print hundreds of millions of stamps with a new denomination. The rate increase, from 10¢ to 13¢, occurred just after Christmas. As postal costs increased, the USPS began to increase their rates for the various classes of mail. Before becoming effective however, these rate increases had to be submitted to the Postal Rate Commission (PRC) for approval. Often, the PRC would take as much as a year conducting studies and compiling data before accepting or rejecting the changes. If the rate increase was approved, the postal service then had to rush to design and produce the new stamps. US #1579//3629 – Set of 85 rate change stamps issued between 1975 and 2002. Click image to order. In 1975, after the rate had changed from 10¢ to 13¢, the postal service printed a new non-denominated stamp so it would be ready and waiting for the next rate change. The letter “A” was used to represent the unknown rate, so the stamps could meet customer demand until new definitives bearing the actual rate were printed. When the rate increased in 1978 from 13¢ to 15¢, the first letter rate change stamps, #1735, 1736, and 1743, were put into use. US #4125 – Fleetwood Plate Block First Day Cover. Click image to order. For more than two decades, the USPS continued to produce these “alphabet” stamps, with the final H-rate stamps being issued in the early 2000s. Other non-alphabet rate-change stamps would be issued during this period as well. 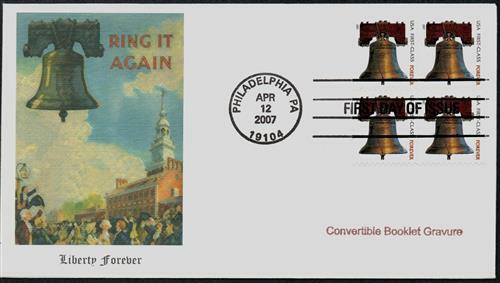 US #4125/4437 – Get all 13 Liberty Forever stamps in one order. Includes a handy identification guide. Click image to order. Then in 2006, the USPS requested permission to create a new type of non-denominated stamp, similar to what the United Kingdom had done. The UK had begun producing stamps with “1st” and “2nd” (as in classes of mail), rather than denominations. These new “Forever” stamps, as they called them, would be valid for first-class postage. Customers would be able to purchase Forever stamps at the current first-class postage rate and use them anytime in the future, regardless of rate increases. 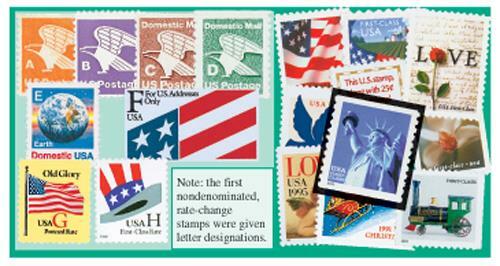 If successful, it would prevent the need for rate-change stamps, making things easier for both the USPS and mailers. 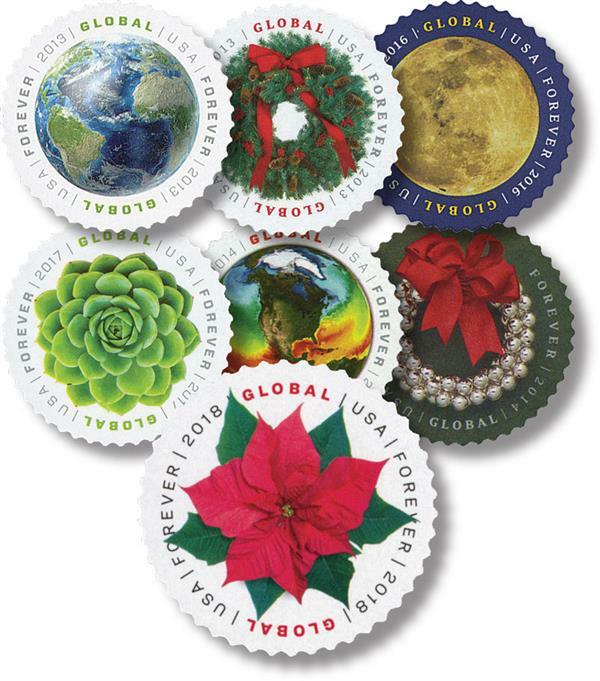 US #4478-81 were the first holiday-themed Forever stamps. Click image to order. The first Forever stamp was unveiled to the public on March 26, 2007. And it went on sale shortly thereafter, on April 12, 2007. 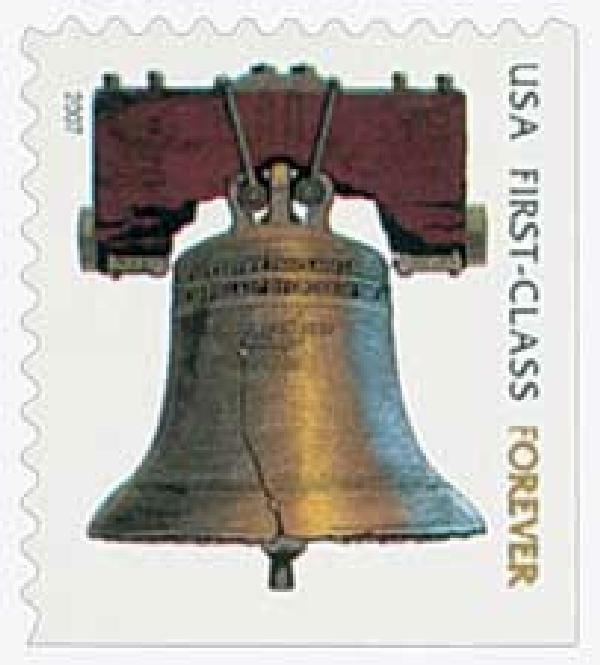 The First Day ceremony was held in Philadelphia, Pennsylvania, which was fitting since the stamp pictured the Liberty Bell. US #4486-87 – These stamps caused a bit of a stir. It turns out the Statue of Liberty pictured is actually a replica in Las Vegas. Click image to order. For several years, the Liberty Bell was the only Forever stamp, and other stamps of the time were issued with the current denominations. 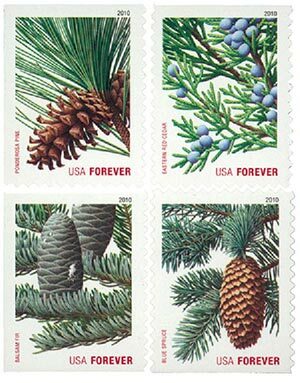 In 2010, the USPS released a new Forever stamp, picturing pinecones on evergreen trees. And two months later, they issued the Lady Liberty and Flag Forever stamps. US #4740/5311 – Set of seven Global Forever stamps. Click image to order. 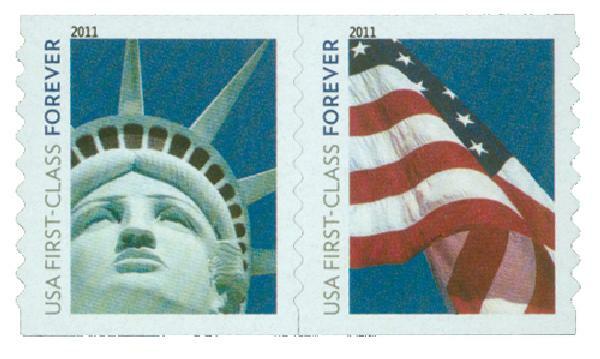 Then in 2011, the USPS began issuing all first-class stamps with the Forever designation. In 2013, they began producing Global Forever stamps for first-class international mail. And in 2015, the Forever concept was applied to postcard stamps, non-machinable surcharge stamps, and two and three ounce stamps. 2 Responses to "This Day in History… April 12, 2007"
To me, the A through H stamps are still an unknown. We used to have a saying,”You can’t tell the players without a program”. How much would one add to an A through H stamp if they used it to mail something today? I don’t know that the Post Office personal would know either. Thank God for the word “Forever “printed on our stamps today. Thank you Mystic for helping to break the code. I too was forever looking up the value of the alphabet soup issues so decided to make up a list of all the past non-denominated issues. Having found it helpful I showed it to my local postoffice clerk,she thought it would be a help. Printed up copies to post in the lobby and distribute around thto the local POs. Now each time a rate increase is announced I make the addition to that list and also make a current poster with the new rate date and values. My contribution from the philatelic side.